Google has been recently investing more and more in the Healthcare space. They are improving Google search with specific health care cards and quick information for the user, as well as working harder on research and cloud initiatives. Google Modus is a mobile app that helps people monitor and manage their mental health. The aim is to give users a customized experience so they can be in control of their illness. Understand the experiences and pain-points of individuals living with a mental illness. Design an Android mobile app that helps users monitor and manage their mental health. Design a logo for Google Modus that is also in line with the Google family. Google Modus was born. While still a work in progress, the app is a customized experience for any user who needs help managing their mental health. User can set goals, reminders, and track activity. Secondary Research- to help me understand who is affected by mental illness and the options for people to get help to manage their treatment and overall wellness. I also wanted to gain quantitative data from studies medical studies. Contextual Inquiries- Conduct interviews with people who are diagnosed with a mental illness. Empathize with individuals dealing with various diagnoses of mental health issues. Learn about their specific experiences to uncover how they are similar and how they differ. Better understand how people manage their mental health. Understand if a wearable technology could aide in the management. To gain empathy before moving to contextual interviews I looked to online support groups for people to share their experiences and struggles. I found that individuals have their own unique management systems that can take years to establish. I drafted up an interview guide and set up meetings to talk with adults one on one about their experiences with managing mental health. I was able to interview six people with a variety of illnesses including Major Depressive Disorder, Generalized Anxiety and Obsessive Compulsive Disorder. I synthesized my research by creating an empathy map. Using post-its, I organized direct quotes from my interviews and looked for patterns that emerged. I was then able to outline the key insights and user needs. She is the persona created from my research findings. Angela's depression has been addressed in different ways during her ten year diagnosis, but she currently relies on medication, therapy and consistent exercise to stay healthy. She needs a management system that accounts for her specific experiences. It was important to understand the journey of Angela on any given day. I outlined the actions she takes, how each of those actions make her think and feel, and how that shapes her overall mood as she moves through her day. During my research I learned that managing a mental illness will be a little different every day. But over time there are trends that emerge with each individual. This journey map shows some of the trends in Angela’s life while dealing with depression. After a few brainstorming sessions, I still felt that I needed to uncover more insights about unique management systems in place for mental health. Perhaps there’s a different way to think about mental health management systems that aren’t just medication reminders or sleep trackers (both which already exist). With my timeline being limited, I decided to contact my interviewees with some follow up questions about their specific management systems and how they have evolved over time. Specifically I’m looking to understand how people engage and relate to others during times of isolation. By doing this, I think I can provide a better solution for Angela. I conducted more secondary research and found that one of the building blocks of happiness is interacting with others. Humans are social beings who feel more fulfilled when they are looking out for each other and experiencing things together. Many people who struggle with mental illness tend to isolate themselves, cut themselves off from social atmospheres, or have a hard time communicating with others. While this came up in my first round of interviews, I chose to do a follow up with the participants about how they break the habit of isolation. I found that people look to close friends to socialize with on a consistent basis. Making plans with friends not only promotes activity but it helps them stay accountable. Next I updated my persona and generated new How Might We... statements. I then completed additional brainstorming sessions. After prioritizing the features needed to meet Angela's needs, I built a framework for how they would be organized. The application map and user flows will help me identify further solutions to the problem. The application map was designed to outline the structure of the app. While creating this, I referenced other Google apps to make sure the app would align with their standards. Using the Sitemap as a foundation I outlined the steps the user would need to go through to complete each task, including where they would be in the app. The user flows show the process of onboarding and setting up a goal, setting up an action they would like to track, and creating an event that is related to their goal. 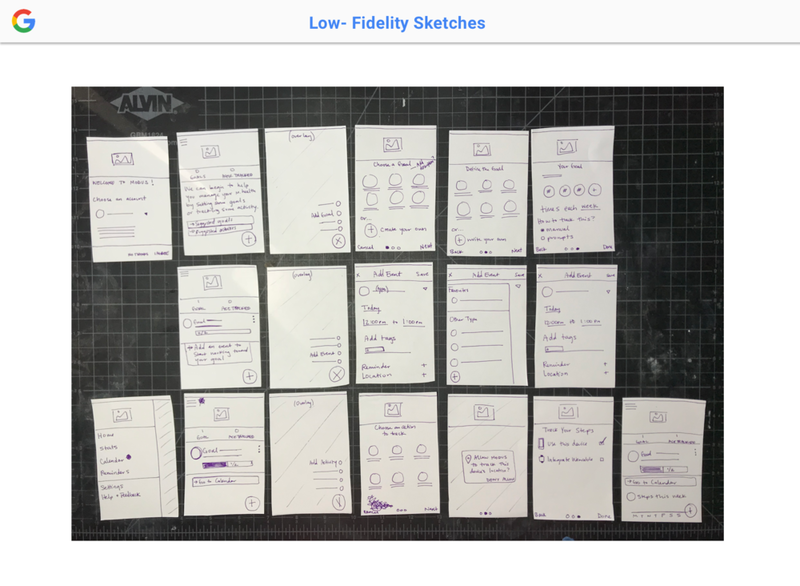 Using the sketches as a guideline I then drafted up mid-fidelity wireframes. I would use the wireframes to construct a prototype that I could then test. I also created a document to annotate key UI elements and further explain my design decisions. Using Marvel I created a prototype and asked users to complete four tasks: set a goal to socialize, start meeting that goal, start tracking their steps, and find the event they scheduled on a calendar. It was difficult to find participants within my timeframe, but I was able to test three individuals who were diagnosed with a mental illness. 1. Determine if users can navigate through the process successfully. 2. Determine if users who currently use Google Calendar would use the calendar feature. 3. Locate areas where user’s are hesitant or confused. 4. Field responses on the concept and process of setting/meeting goals, tracking steps, and creating events. 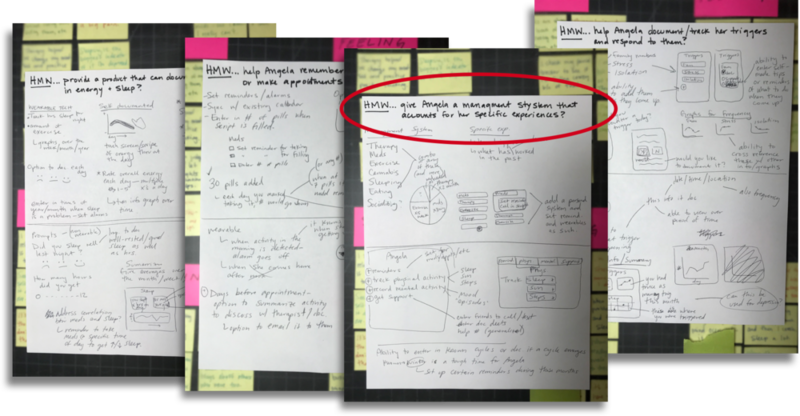 I analyzed the test findings by creating an affinity map that organized the results and helped outline the next steps I need to take when creating the high-fidelity wireframes. 1. Clarify how to set and accomplishment goals. 2. Design a larger visual element to show goal completion. 3. Reorganize the dashboard to emphasize the user’s goals. I started designing the visual components of the product, by crafting a logo. It needed to represent the concept of Modus and also fit into the Google family and follow the Material Design principle. I started with rough sketches and then moved to digital. I added the color palette using Google’s color tool. I wanted the design to feel calming for the user but I also wanted to motivate them and build confidence in setting and meeting goals. I chose the color palette and illustrations with this in mind. I did not want the app to look clinical or overwhelming, instead it should welcome the user without judgement. Using the information I gathered from testing and the style tile I created high-fidelity wireframes. The screens show the user (Angela) opening the app as a new user, setting two goals and creating an event to start meeting those goals. Mental health is an incredibly complex issue to tackle. This project came with a lot of challenges. But along with those challenges, I learned about some of the lives affected by mental illness. And while it’s still a difficult issue to talk about due to stigma and judgement, it’s important to keep trying to find solutions for those involved. This project was rewarding because I used empathy to generate solutions and innovative ideas.